Now that we’re sitting in Indiantown Marina and it’s obvious that we’re going to be here for quite a long time while we fix up Daze Off to sail, I don’t want to bore you with stories that are only related to boat work (but don’t worry, they’re still coming). I know that’s what some of you crave, but if you’re like me, you also need a little fun in there. A little travel and a little adventure. So for the foreseeable future while we are doing nothing much more than boat work I will be adding a Throwback Thursday post in every week as well. Cataloging our trip so far, giving you that needed sense of travel and adventure, and for those of you that haven’t started with us from the beginning, catch you up on some of the most important or memorable parts of our travels. This post only finds us a few days after our Machu Picchu climb (and one really cool walking tour of Cuzco), but it was just something I felt deserved it’s own throwback. The time we went to Lake Titicaca. An actual downfall from the sights we had been seeing but something I have to look back on and smile because it was so bad that in it’s own way it was spectacular. A nice history lesson thrown in with a story of probably one of the worst towns we have ever visited along with knowingly falling into a huge tourist trap, all because we had two spare days of time on our hands. What can I say though? 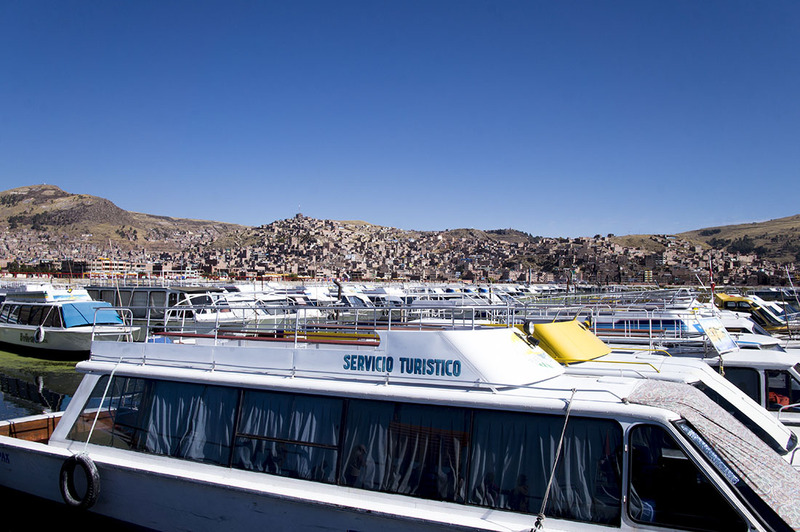 It may have been the bad side, but at least I’ll always be able to say that I’ve been to Lake Titicaca. And now I have a hilarious story to look back at and shake my head whenever I’m reminded of it. Does anyone remember back to their 6th or 7th grade geography lessons where you first started learning about countries other than your own? And in there you would be introduced to funny sounding places like Zimbabwe or Uranus (ok, so that was more of a science lesson) or best of all, Lake Titicaca. A mix of English and Spanish naughty words that you’d run home and repeat in front of your parents because you couldn’t get in trouble if you were only echoing the name of what you learned in class. Something everyone would snicker at during the lesson and your teacher would stand up a little bit straighter themselves, and remind you to act like adults? Yes, it was fun for us all, and I’m sure I’d be able to keep just as straight of a face during a lesson of it today as when I was 13 years old. To give a quick history lesson though, the name itself is derived from Titi, an Aymara mountain cat, and the Quechua word caca, meaning rock. 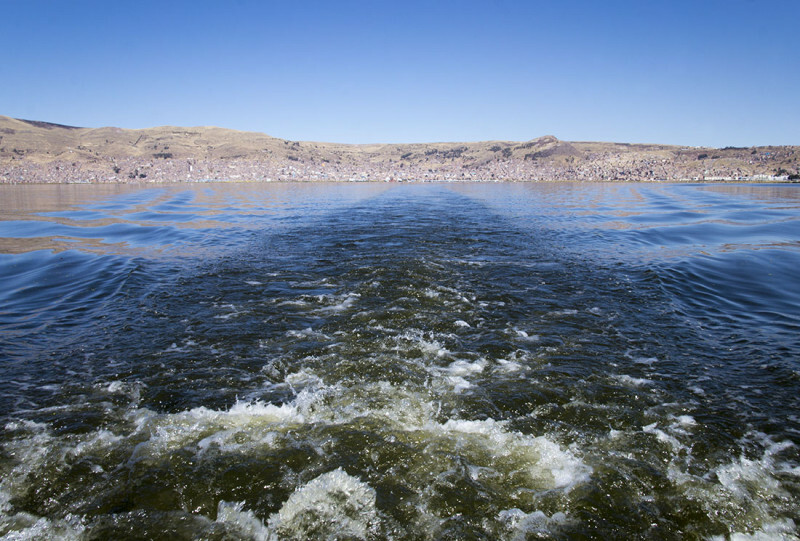 This refers to the sacred rock on Isla del Sol which was worshipped by the Pre-Inca people on that island. We had been warned not to come here. 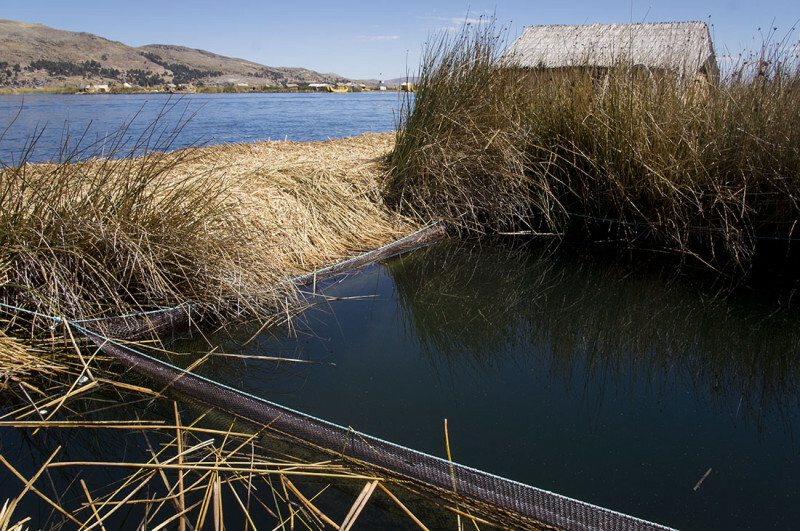 Not to Lake Titicaca necessarily, that’s supposed to be beautiful. 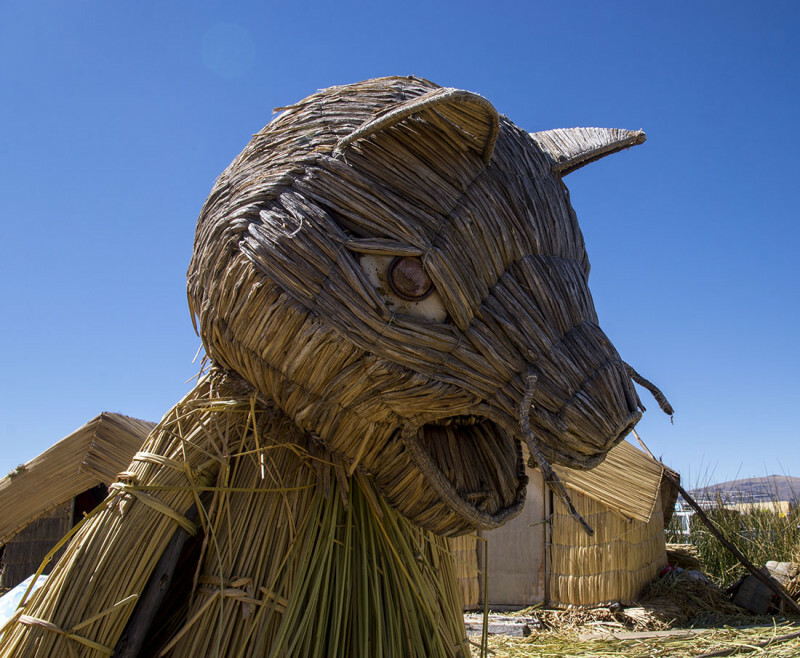 No, we warned not to come to Puno Peru. That it’s dirty and desolate and not worth seeing. Our friends that had given us this information were not wrong. 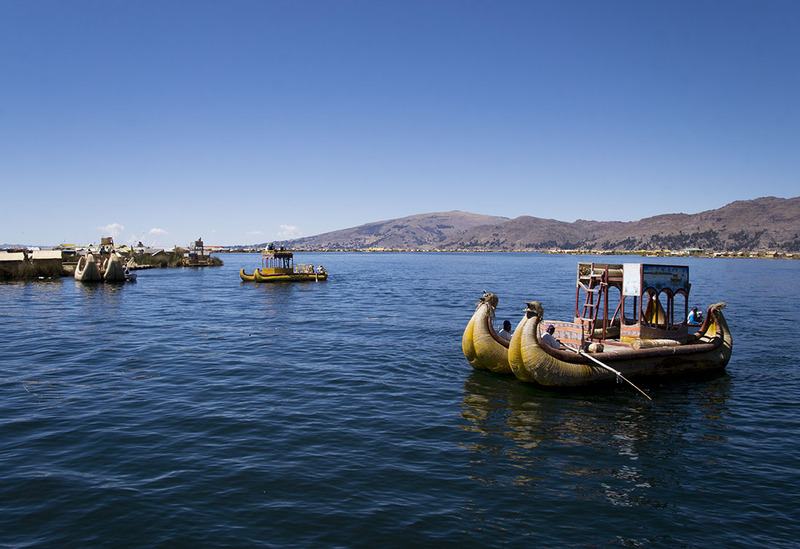 They said, “Yes, visit Lake Titicaca, but be sure to see it from the Bolivian side, that’s the only part worth seeing”. This could not work in our favor for two reasons. The first is that we’re running on a four week schedule and already trying to cram three countries into that (Peru, Ecuador, Colombia), and a fourth would be just asking a little too much. The other is, and thank goodness I was so into reading Bumfuzzle’s adventures or I may not have known, that Americans and Americans only must procure a Visa to get into Boliva at the cost of $135 per person. We’re still on a relatively tight budget with our land traveling, and that would have come close to breaking it. Add in the extra bus rides, the blah blah blah. It just wouldn’t have worked out. But we couldn’t not go. It would be like road tripping through Israel (as so many of us do) and coming within 30 miles of the Dead Sea but saying, “Meh. Maybe I’ll catch it on the next time around”. You can’t do that. It’s something you must see, even if it’s just for the bragging right’s alone. Plus the bus company happened to be running a special between Cusco and Puno, and that just sealed the deal. We tried to look on the positive side of things and say ‘It can’t really be that bad, right?’ as we waited at the terminal for yet another overnight bus. 2 nights without hostels = bus tickets paid. We should have known right away that things wouldn’t be as great as we hoped when, while sitting in the bus terminal with another set of backpackers, we all watched the local news which was showing footage of Puno from a few days earlier where the lake had frozen. Yes. It had gotten so cold there that the shores on this massive body of water had turned to ice. Our groups looked at each other with shock, each of us probably wondering if our tickets were refundable. After we had boarded the bus and were dropped off at our destination at 4:30 am we found the conditions were fortunately not quite as cold as forecast, but I was ready to check into the hostel that I had found online which advertised 24 hour reception and no check-in time. Hooray, there might be a warm bed waiting for me soon! We’re used to the hostels which proclaim they’re within one or two blocks of the city center to be relatively nice and in upstanding neighborhoods. This one was not. Our taxi sped away as we stood on a pitch black street, excitedly ringing the buzzer while we listened to what sounded like shotguns echoing just a few streets away. It felt like forever before anyone finally came to the door. Paying just a few dollars extra we booked a private room, and just as the sky was beginning to light we were ushered to our room which had no heat and I passed out under the covers while wearing three layers of clothes and still shivering. Our next bus wasn’t scheduled to depart until the following night, so we spent our first day in Puno just roaming down the streets to see what we could find. It definitely was not a classy town, and we couldn’t find much to occupy our time outside. The Plaza de Armas was largely undesirable and there were no good spots to see the lake within walking distance. One of the only good things to come of the day is that I found a woman selling knit goods, and Matt let me buy a llama skirt. I really have no idea where my recent obsession for these items has come from, but I’m pretty sure it has to do with the Disney flick ‘The Emperor’s New Groove’, which of course takes place in Peru. Haven’t seen it yet? I suggest you give it a watch. Just as funny for adults as it is for kids. The other thing is that we found a large shopping center with a food court, and in that food court was a Chinese restaurant that offered orange chicken. We have not been able to find that in any of the million chaufas around. Leftovers were brought back to our room where we enjoyed them while watching a movie on my laptop while lying in bed. 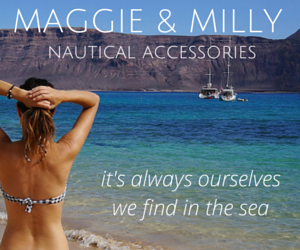 It’s the simple things in life…. Ok, now on to the reason we came. 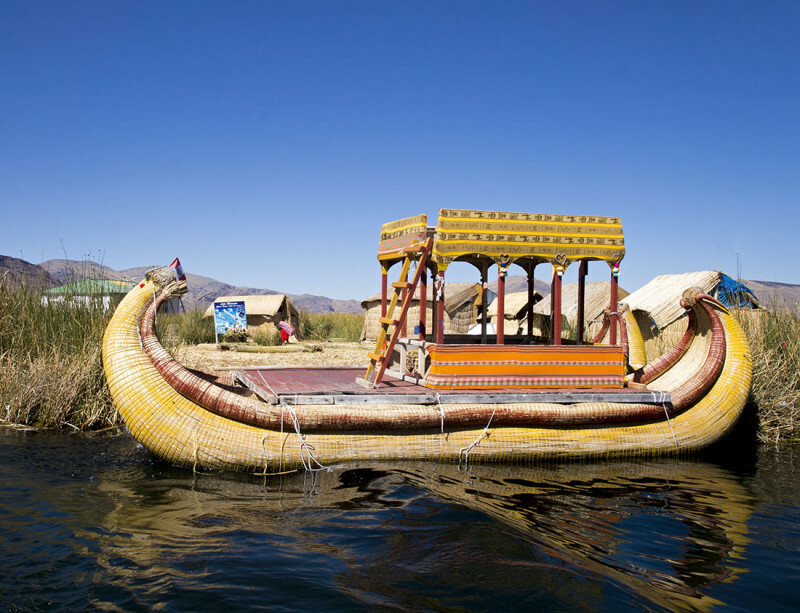 One of the draws of Lake Titicaca is that it is the highest navigable lake in the world at over 12,500 ft above sea level. 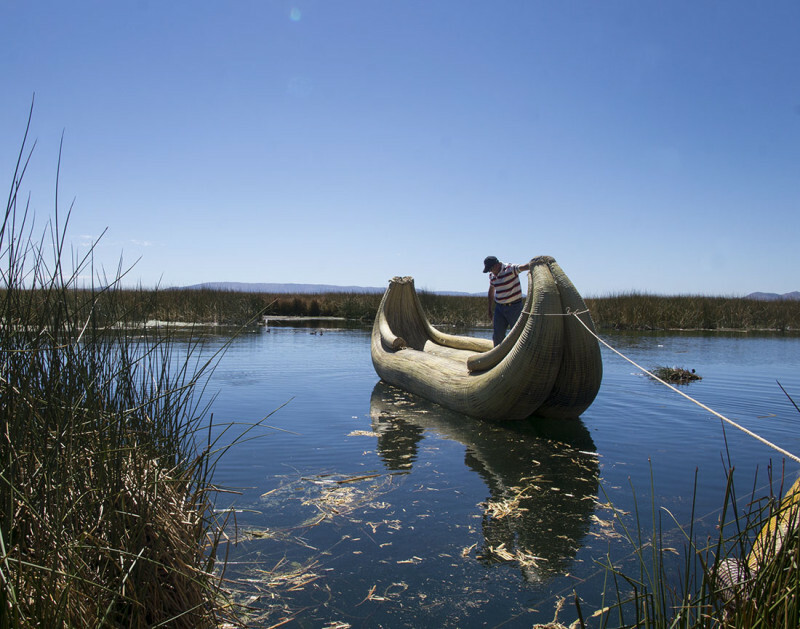 Many of the tourist visiting the lake will take ferrys to some of the nearby islands to get a feel for the local culture that has been developing here for thousands of years where the inhabitants have been worshiping the lake’s mystical powers since Pre-Inca times. 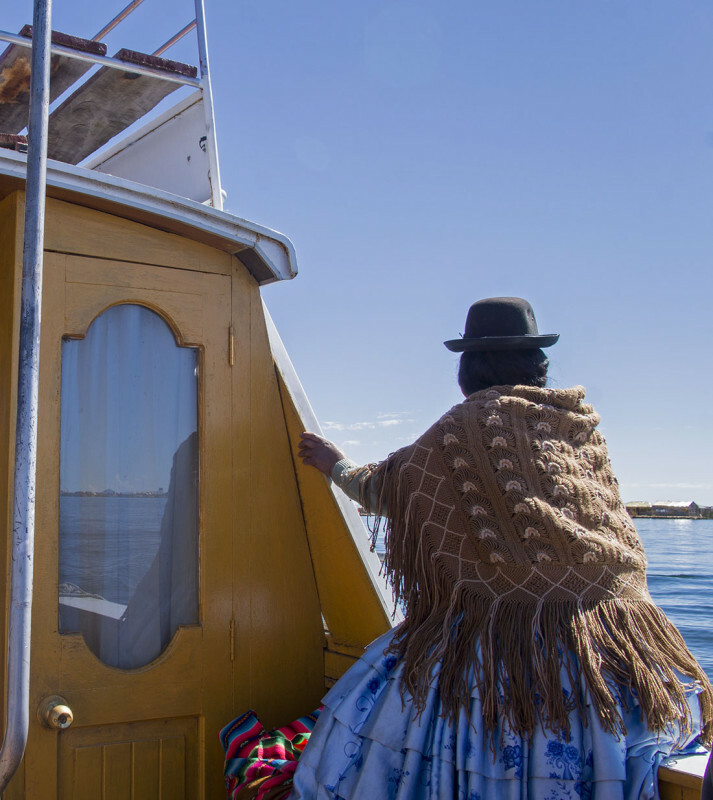 The best place to get a feel for these cultures are Isla del Sol (where the scared rock is, on the Bolivian side) or Taquile on the Peruvian side. We were going to neither. 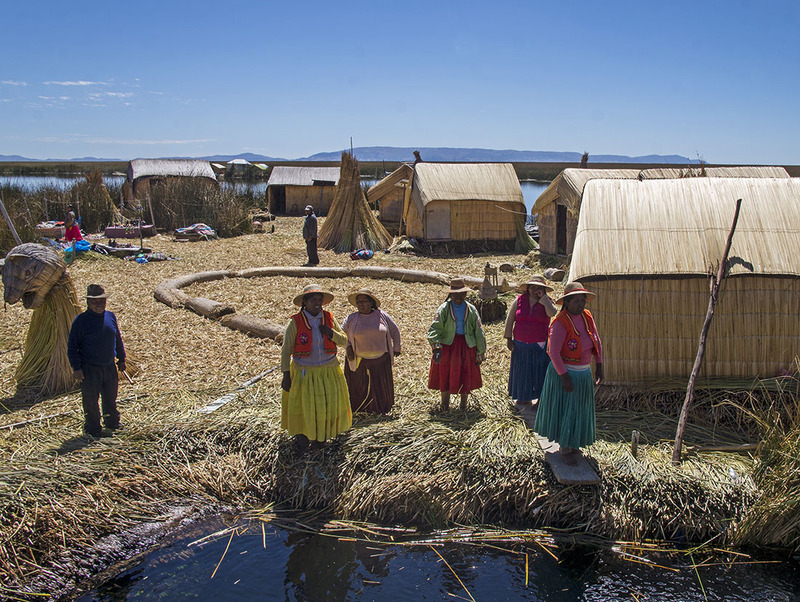 Our visit was going to be to the floating reed city of Uros. Partially because a floating reed city sounded pretty cool, and partially because we didn’t get up early enough to make the 30 mile journey by water to Taquile. 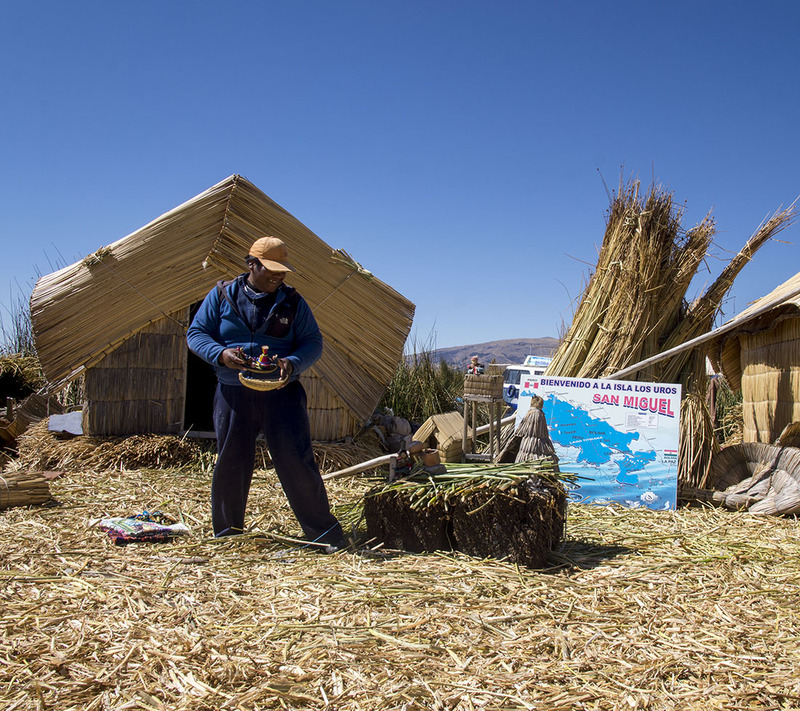 We’d heard that Uros can be a little less than authentic and very heavy on tourism, but again, this trip was soley for bragging rights. Boarding a ferry with about six other tourist and a few locals, we were off to the floating city. 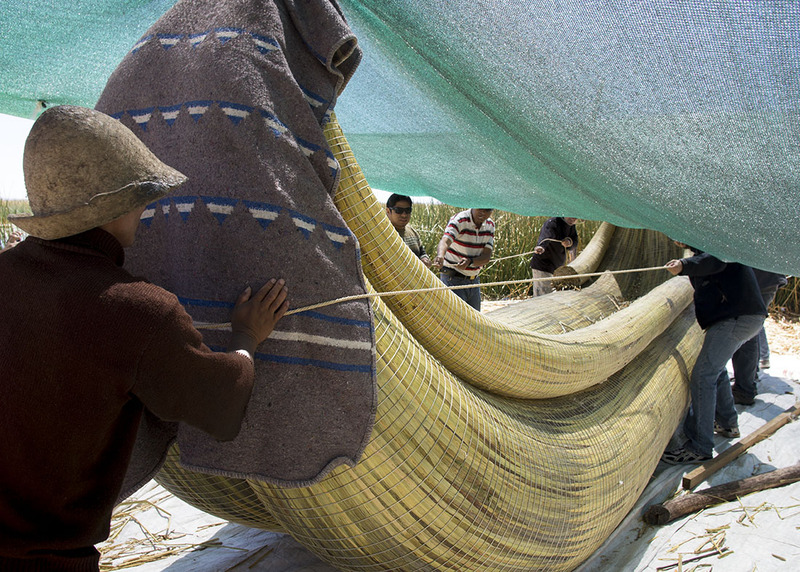 “The islets are made of totora reeds, which grow in the lake. The dense roots that the plants develop and interweave form a natural layer called Khili (about one to two meters thick) that support the islands. They are anchored with ropes attached to sticks driven into the bottom of the lake. The reeds at the bottoms of the islands rot away fairly quickly, so new reeds are added to the top constantly, about every three months; this is what makes it exciting for tourists when walking on the island. This is especially important in the rainy season when the reeds rot much faster. The islands last about thirty years. Following the introduction to the islands, we were broken into smaller groups of 1-2 people where one of the women who resides on that particular island shows you around and answers questions. Thankfully ours spoke English, so we were able to follow along as she showed us the hut that her family lived in, the one bed they all shared, and the two sets of clothing she owned for different occasions. While walking past her home, she also introduced us to their pet eagle, who looked like it was eyeing Matt up and down for lunch. When she finished talking about her day to day life, she led us to a small area where a blanket and table were sprawled out, showcasing items for sale that her or her husband had made. This was the tough part of the tour. How do you tell someone who’s basically living off the proceeds from tourism that, not only do you live on a boat and don’t currently have the extra space or a need for a baby mobile made with reed canoes (cutest thing ever, when I have a baby I’m going to come back here just to buy one), or that you’re living out of a backpack at the moment which is already overstuffed with the wheel of cheese you bought in Cusco and there is no room for anything new? The answer? You can’t tell them no. You would just feel like the biggest jerk ever. Matt eyed all the goods in front of him and took a fancy to a textile that showed the history of the island. 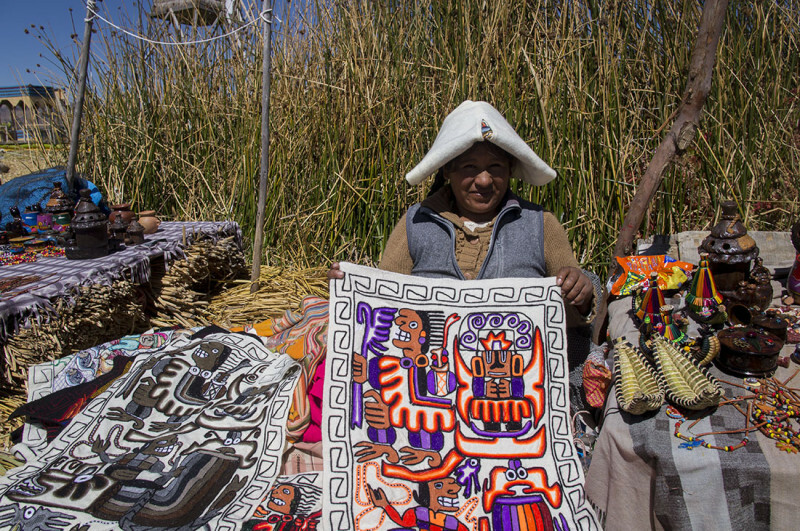 Our guide told us that it had taken her 30 days to make, and knowing that we could easily fold it down and hopefully hang it in a future home, we gave her $30 USD for it and wished her well as we rejoined the group for a ride in one of the fancy ‘Mercedes’ reed boats to the capital city. As we pushed off, the women of the island gathered together to sing us a native song as we departed. It was all for tourism, I know, but still kind of nice to enjoy. The only interesting part of the day was where all the men in our tour group were momentarily stolen away to help launch a new, yet very basic, reed boat. Coupled with two or three local men, the four guys in our group grunted, pushed, pulled and shoved this massive raft into the water. Participating in local culture, see that’s what we were looking for on this visit. As soon as this local boat was floating, our fiberglass one was back to pick us up. We boarded the top deck and stared at the little floating cities our whole way out of the bay. Was the trip here worth it? It’s hard to say. On one had we were witness to cultures and some traditions, such as their living structures, that have been in place for thousands of years. On the other hand, they had made it so commercial that you felt though even though you were there to observe it, it was played up soley for your viewing pleasure. A song and dance and a hand outstretched for a tip after. So would I do it again? Of course! I now have the bragging rights that I’ve been to Lake Titicaca (snicker).